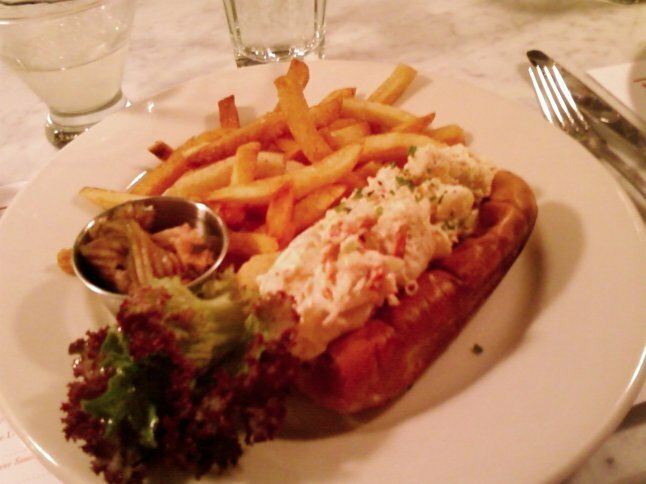 A lobster roll, served with fries, during a recent trip to Ed’s Lobster Bar. Everyone is going crazy for them, including Mrs. F. and I. It’s as if we’re all search of that perfect lobster roll of memory. Two come to mind for me: one from Cap’n Cass, the Rock Harbor, Mass. seafood icon, the other from Nickerson Fish and Lobster at the Chatham Fish Pier. Benjamin dug into the craze in a recent New York feature on the lobster glut. Among the purveyors Wallace mentioned in his story was Ed’s Lobster Bar, a Lafayette Street galley that Mrs. F. and I recently visited. The brainchild of Ed McFarland, a former sous-chef at Pearl Oyster Bar, Ed’s feels like a well-worn seaside stalwart. As I say, the place is a galley — terribly narrow — and most of the seating is crowded around a long, marble-topped bar. It’s quite loud and there’s a wait, but it’s worth standing outside for 20 minutes and enduring an impossibly sloshed cadre of Southern belles. We split a dozen Malpeques, which were quite good. I ordered the roll and Mrs. F. had a piece of grilled tilefish, which she said was quite nice. The roll was splendid, if not as glorious as the aforementioned versions on the Cape. Served on a tiny buttered roll, the lobster salad very nicely executed. Not too much mayonnaise and not too much spice. The cocktails were also good. An old friend from New Jersey whose boyfriend is a seafood aficionado recommended the chili-infused Margarita. Definitely worth another visit, though you ought to be warned that the roll is priced a bit high at $28. We’re going to be exploring a couple of other lobster-roll meccas through the rest of the summer. Stay tuned. Tipsy Parson, a glorious little cafe on 9th Avenue at 20th Street. My sisters-in-law continue to gather their possessions in a new Chelsea apartment and my in-laws descended from Buffalo this weekend to help shepherd the process. On Saturday morning, my mother-in-law and I set to making Father’s Day brunch arrangements and, following the advice of New York magazine, we selected Tipsy Parson. 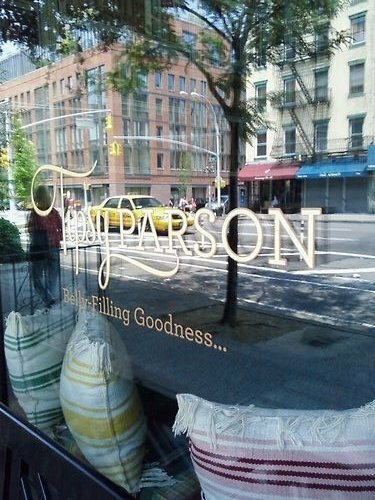 Located on 9th Avenue at 20th Street, Tipsy Parson is a charming little café whose offerings have both enthused and disappointed in Manhattan’s foodie circles. Count us in the former camp, as were quite impressed with the brunch offerings at the place, whose glance is assuredly anchored in a southward direction. Adam Platt, in his February review in New York magazine, was disappointed that glance didn’t reach south enough. Oh well. We were pleased. We’ll begin with cocktails, an essential part of the ejforbes.com ethos. Mrs. F., my sister-in-law, Chrissy and I were all satisfied with our Bloody Marys. Served in Collins glasses and garnished with olives, they were billed as “smoky” on the menu. We didn’t pick up on that, but were impressed that the drinks were neither too strong nor too spicy. On the contrary, I thought there was just enough horseradish. Most of our party ordered some variation on eggs. Mrs. F. and my sister-in-law, Leigh, selected eggs baked with fresh chorizo, queso fresco, sauteéd greens. I tasted Mrs. F’s and was impressed. My mother-in-law and Chrissy each opted for mushroom toast: eggs scrambled with herb ricotta topped with sauteéd wild mushrooms and served on toasted potato bread. No complaints. Pete, Chrissy’s amiable associate, went for the lemon-cornmeal pancakes, which he said he enjoyed. My father-in-law and I kept it simple and ordered granola with yogurt and berry compote. The berries were fresh and delicious and the granola included flaxseed, pumpkin seeds and almonds. Delicious. Other options on the brunch menu that I’d try in the future are the Catfish Po’boy, chicory salad and a pimento cheeseburger. Given the close proximity to my sisters-in-laws’ apartment, I hope we get to try TP out for dinner too. The rest of the cocktail menu looked quite interesting and I really liked the way the bar area was set up. As you walk into the place, there’s a casual sitting area with needlepointed stools and walls that feature trompe l’oeil coverings made to look like bookshelves. The back dining room, where we ate, features a long, well-worn dining table. Staffordshire dogs were perched on shelves alongside a collection of silver and glass plates. Tipsy Parson opened late in 2009 and is the western sister of Little Giant, the fashionable Lower East Side joint that counts legions of New Yorkers as fans. If you have occasion to be in Chelsea, give TP a try. 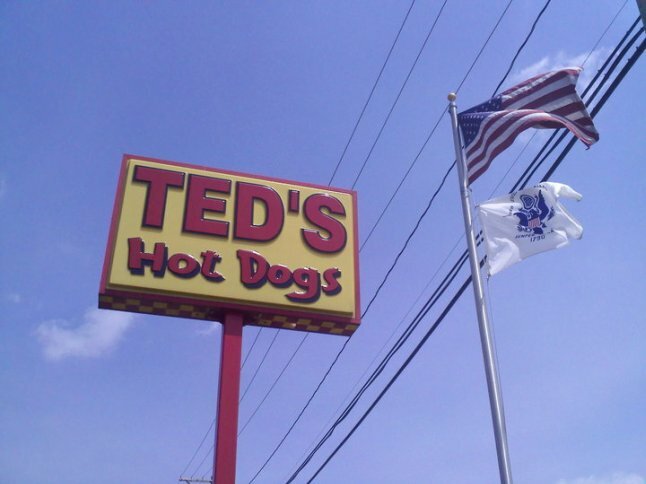 The sign outside the Amherst, N.Y. location of Ted’s Hot Dogs. Long have I heard glorious tales of Ted’s Hot Dogs, the iconic Buffalo food stands. My wife, my in-laws and food celebrities around the world have raved about the place. Alas, in the six years I’ve been shuffling off to visit Mrs. F’s family, I’d never been there. I’d never experienced the char-grilled wonder, nor had I washed it down with Loganberry. I was empty, lost and hungry. Then, at last, fate intervened. On our recent trip to Buffalo, Mrs. F. and I ran an errand in close proximity to the Amherst location. Embarrassed that she had not shared the culinary riches of Ted’s, Mrs. F. treated me to lunch. And what a lunch it was. The hot dogs were glorious, lovingly grilled over charcoal and topped in my case with mustard. A special hot sauce is also available, as are relish, onions and ketchup. For sides, we opted for both french fries and onion rings, each of which were rendered perfectly. Liquid nourishment was in the form of Aunt Rosie’s Loganberry, the raspberry-flavored pop that’s a tradition in Southern Ontario and Western New York. The soda has its routs in Crystal Beach, the popular Lake Erie resort. Chicken breasts and hamburgers were also available, though we didn’t partake of them. While it’s difficult to do, I have to rank Ted’s above Stewart’s, the New Jersey chain I’ve written about previously. I would, at some point, love the chance to eat Ted’s hot dogs with Stewart’s root beer. That would be a barbecue match made in heaven. Ted’s does serve Mug root beer, but that doesn’t compare. I strongly recommend Ted’s to all my readers and though I was deprived of it for ages, it’s a must for any trip to Buffalo. 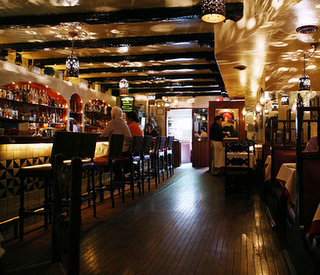 El Parador Cafe, New York’s venerable Mexican restaurant, is another wonderful institution of Old New York. My mother-in-law has been down from Buffalo for a few days. We spent Sunday in town, stopping off at MoMa for the fantastic, if mobbed, Tim Burton exhibit. After battling the crowds, we made our way down to Murray Hill where my sister-in-law, Leigh, lives. For dinner, Leigh recommended we stay close to home and so we settled on El Parador Cafe, located just passed the eastern terminus of the Queens-Midtown tunnel on 34th Street. It doesn’t look like terribly much from the outside. A faded awning covers a faded red door and an unassuming stucco exterior. The menu, displayed in a barred, seemed adequate, but we weren’t expecting anything near the revelation we had. As we waited to be seated, I poked around the vestibule to look for matchbooks. Though there were none to be found, I did discover old framed reviews from the late and much lamented Herald-Tribune, the Times and New York Newsday. I knew immediately that I’d stepped into another wonderful institution of Old New York. First established in 1959 on Second Avenue at 31st Street by Carlos Jacott, El Parador is owned today by the father-and-son team of Manuel and Alex Alejandro. They’ve preserved a 1959ish vibe at the 34th Street location. Perforated tin lanterns provide a delightfully muted light. Elaborately carved chairs with rush seats surround surprisingly formal tables. A soundtrack heavy on salsa and other Latin classics adds to the charm. And the food. I can’t say enough how impressed we were. Freshly-baked corn chips were served with two varieties of salsa, one warm and one cool. The latter had terrific cinnamon notes we’d never before encountered. The guacamole was also terrific and was correctly served in a well-worn lavastone molcajete. Mrs. F. and Leigh took a look at the vegetarian menu, which is available if you ask for it, and decided to share some black-bean-and-spinach and chicken enchiladas. My mother-in-law and Caitlin, Leigh’s roommate and a very good friend of all, both raved about their chicken fajitas. After weighing my options and almost going with a Chilean sea bass served grilled and in lobster broth, I instead selected the Ropa Vieja Mexicana. Caitlin and Leigh, whose friends had previously discovered the wonders of El Parador, strongly recommended my choice. Served with black beans and tasty plantain tostones, my skirt steak was a dream. Drinks, too, were spot on. The ladies enjoyed a pitcher of red sangria and Mrs. F. allowed me to sneak a sample. Not too sweet and hardly absent of the requisite fruit flavors. My margarita was also concocted and served by the book. So, if you’re looking for quality Mexican that’s neither trendy or one step away from street food, get thee to El Parador. I guarantee you’ll be as pleasantly surprised as we were. 325 E. 34th St. near Second Ave. The lobster roll at Ditch Plains, a delight on Bedford Street. On a dreary Sunday not long ago, we headed into town to watch our good friend Clarke take part in a cricket match at Chelsea Piers. Equally good friends Tim and Johnny joined us. After Clarke’s Philadelphia Cricket Club team ended their competition against an assembly of enthusiasts from Hoboken, we headed south for a late brunch. John, whose command of Manhattan’s culinary wonders should probably be harnessed for publication here or elsewhere, led the way to Bedford Street and Ditch Plains. Named for a bit of Montauk beach adored by surfers, Ditch Plains opened in 2006 as a kind of homage to the New England Clam Shack. The place is the brainchild of Chef Marc Murphy, whose Landmarc has made waves in TriBeca for the better part of a decade. It’s all wood and steel, but it’s hardly industrial. The booths are comfortable and so was the bar. Comfort carries over to the food at Ditch Plains, where the menu is classic Americana. 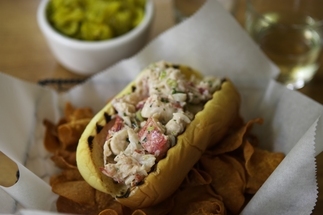 Beyond the lobster roll, there’s divine curried chicken salad served on potato rolls, grilled skirt steaks, meatloaf, fresh clams, calamari and even, Gods be praised, hot dogs. I’m still salivating over the chicken salad, nine days later. Paired with the food is a terrific wine list and wonderful cocktails. The Bloody Mary was chock full of horseradish and was garnished by crunchy pickles. A note on the wine, which runs the gamut in variety and price: Following the practice of Landmarc, it’s only served by the bottle or the half-bottle. Dominick’s on Arthur Avenue is a real Bronx treasure. If you’re heading to Arthur Avenue and you aren’t in the mood for the relative formality of Roberto and want some simple, old-fashioned Italian classics, you’ll want to explore Dominick’s. The place was recommended to us by our dear friend, Molly McLaughlin, and what a good recommendation it was! 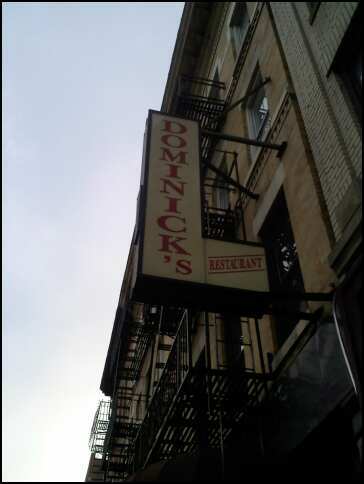 Eating at Dominick’s is to experience Old New York while at the same time playing a mind game with your waiter. The tables are long and communal, the wine is served in juice glasses and the atmosphere convivial almost to the point of a ruckus. Children swirl between the legs of wizened old waiters while their parents slug Chianti and sing loud choruses of praise for the veal. But to address the mind games. There are no menus at Dominick’s. If you ask for one, your waiter will ignore you, walk away and return a few minutes later asking what you’d like. That’s the key to Dominick’s. Know what you want and they’ll create it for you. Though I gather they won’t do everything. The chap next to me asked for sausage and peppers. “We don’t do that,” our waiter replied. We ordered calimari, a chicken picatta and an order penne with vodka sauce. The portions were navigable and were all divine. With four hefty glasses of wine, our bill, which our waiter calculated in his head, was $65. Bring cash. Credit cards haven’t made their way to this old place. Get there. You won’t be disappointed and thanks again, Molly, for the intelligence! 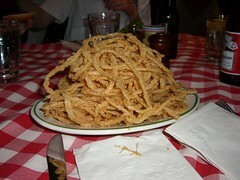 Onion strings are a must if you visit P.J. Clarke’s. It’s become a tradition. Mrs. F’s Uncle Steve journeys south from Buffalo every December for a real estate convention. Every December, we have a casual dinner with him. The menu at P.J.’s, as I’ve written before, is classic American pub fare: Above-par burgers, oysters, pot pie, fish and chips and onion strings, one of my favorite appetizers of all time. Lightly battered and only slightly greasy, the P.J.’s variety are a must whenever I visit the great old gin mill on Third Avenue. Go then, and get thee a burger and some onion strings. J.G. 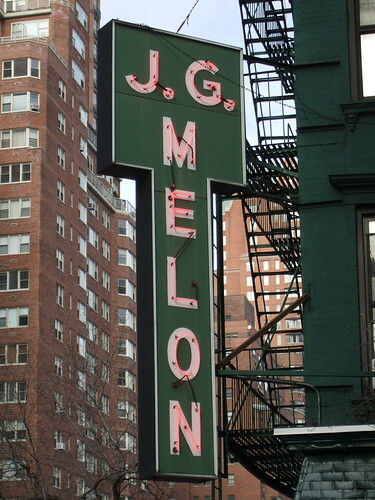 Melon, in the heart of New York’s Upper East Side, is an institution. Where to go for a stag dinner with one of your best friends who recently dropped the hammer and got engaged? J.G. Melon, of course. So when it came time to plan a celebratory dinner for my old pal Tim, there was really no other choice. The call of delicious, beautifully seasoned and cooked hamburgers was too powerful to resist. Accompanied with signature cottage fries — cut in the shape of pickle slices — there’s nothing better for a simple and largely affordable dinner. Far more crowded and noisier than its competitor to the north, Luke’s, Melon’s has a devoted following that includes socialites, celebrities and their hangers-on and politicians. Mayor Bloomberg is a particular fan, as the Times reported last month. The place has made appearances in pop culture, too. Charlie, Fred and Tom drop by in Whit Stillman’s “Metropolitan,” and the Stillman’s “Last Days of Disco” gang retreat to a Melon’s-inspired bar after nights at the club that stands in for 54. Though it’s been there a scant 37 years — a short time when compared with equally important New York watering holes like, say, McSorley’s — Melon’s feels much older. The wait-staff is seasoned and, donned in signature navy-club ties and khakis, friendly. On the walls, beside large wooden menu boards and plaques that pay tribute to regulars, are paintings, prints and posters of all varieties of melons. It’s also safe to say that no music recorded after the Reagan administration will ever be heard as the jukebox is packed to the brim with classics from an earlier era. It’s a relic of Old New York that’s a must-stop on any burger-lover’s itinerary. Luke’s, just around the corner from our good Tim’s place, has been a favorite for years. 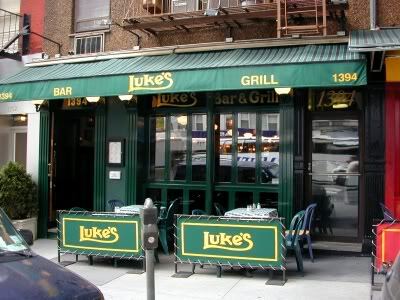 For years, denizens of Yorkville, Lenox Hill and other precincts of the Upper East Side have relied on Luke’s Bar and Grill for consistently decent pub fare. Less crowded and more of a neighborhood secret than its fabled southern neighbor, J.G. Melon, Luke’s serves up solid omelets, burgers and Blood Marys. We’ve frequented the place since our friends, Tim and Carl, moved to the neighborhood five years ago. We were committed patrons during our town Yorkville tour in the year I spent at the j-school. Opened in 1990, Luke’s menu mostly offers staples from an earlier era, like Roquefort and Cobb salads, meatloaf and Chicken Paillard. The full range of expected appetizers are on offer and the soups are equally reliable. Devotees of hamburgers rate the Luke’s entry with high marks. Other sandwiches, like the BLT, are also good choices. The crowd is as predictable. Young families who’ve yet to embark on the trails that lead north and west to the suburbs mix with the fresh-from-college aspirants and Park Avenue dowagers. At brunch, all seem a bit bleary and wonder aloud why they drank so much the night before. While we were enjoying brunch with Tim yesterday, Emily correctly identified the tweedy older gentleman and his wife at the next table as the much-maligned Tony and Charlene Marshall. Luke’s is that kind of place. Johnny, your writer and Tim take in the Heidelberg. The plan had been to reprise our spring trip to Lederhosen, the Greenwich Village answer to the venerable Heidelberg. I met up with Tim at his midtown office and we headed south to Bleecker Street on the Lexington Avenue line. John, who works in the financial district, was to meet us. Tim was as fast on his Blackberry as Clint Eastwood on a high-noon draw. In no time he’d confirmed that the Heidelberg was open. John was informed of the change of plans. North to the old neighborhood and our old friend the Heidelberg we went. An anchor of the ever-shrinking German community of Yorkville since 1936, the Heidelberg is just what you’d imagine a German restaurant to look like. There are dusty old paintings, antlers, exposed beams and silk flowers. The Teutonic experience is further enhanced by waiters in Lederhosen and epic litres of Radeberger, Dinkel Acker, Spaten and so on. Music, which ranged from brass-band renditions of “Ein Prosit” and the Chicken Dance to the best in today’s German pop, serenade diners and drinkers. 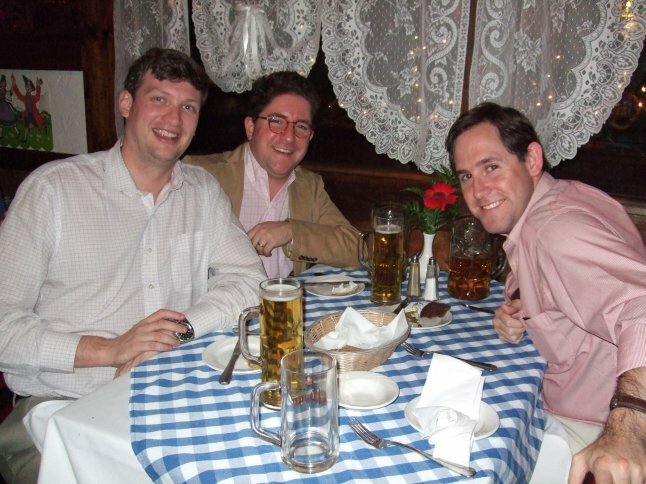 After a round at the bar — Tim and I took down litres of Spaten Oktoberfest while Johnny focused on Radeberger — it was on to the adjacent dining room. There, we ordered up some divine potato pancakes topped with smoke salmon and a dill cream sauce, some bread dumplings and smoked herring. For dinner, I ate a beautiful sauerbraten, while Tim went for a reliable Weiner Schnitzel and Johnny for the more adventurous Schnitzel a la Holstein (breaded veil cutlet topped with a fried egg and capers). All of these were served with delicious red cabbage. We weren’t the only ones the Oktoberfest bug had bitten — by the time we drifted out to the wilds of Second Avenue, the dining room was packed and crowds of wurst-starved New Yorkers were salivating over boots of HB at the bar.